I have to say, I have made and had dairy-free ice cream many times before, but it has never as good as this. I received a copy of Dairy-Free Ice Cream: 75 Recipes Made Without Eggs, Gluten, Soy, or Refined Sugar from Kelly Brozyna of The Spunky Coconut and it has forever changed my dairy-free ice cream eating ways! Not only is this book insanely beautiful, but Kelly has us covered on every ice cream and frozen treat you could ever dream of! This cookbook is loaded with 75 amazing recipes, each and every one totally dairy-free and gluten-free. For this week’s Tutorial Tuesday post, I am teaming up with Kelly to give you a quick how-to on making the perfect dairy-free ice cream, plus a simple recipe for classic vanilla. 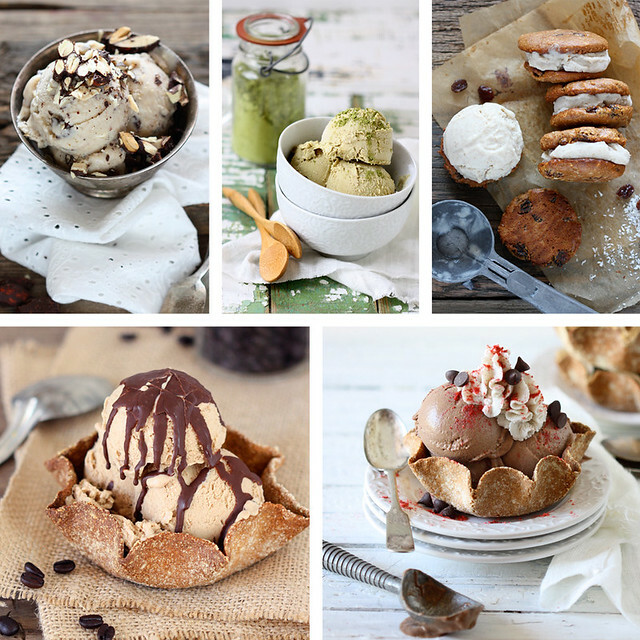 In the Dairy-Free Ice Cream cookbook, Kelly uses her fool proof method to dairy-free ice cream – sharing her versions of classic favorite flavors like Vanilla, Chocolate, Rocky Road, Salted Caramel, Strawberry, Butter Pecan and more. But, the real treat is the collection of unique and innovative flavors, like White Chocolate Goji Berry, Gingerbread Cookie Dough, Saffron and Rose and so much more. As if all that wasn’t enough, you’ll also find frozen yogurt, sherbet and sorbet and she even shares incredible recipes for ice cream cakes, sandwiches and popsicles, plus there are grain-free cookie bowls, brownies, sauces and toppings and more! All made without eggs, dairy, gluten, soy or refined sugar. It’s incredible really. A summertime frozen miracle! 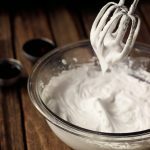 Below you will find a brief tutorial to get you started making the best ever vanilla bean ice cream, my version of Kelly’s classic vanilla. 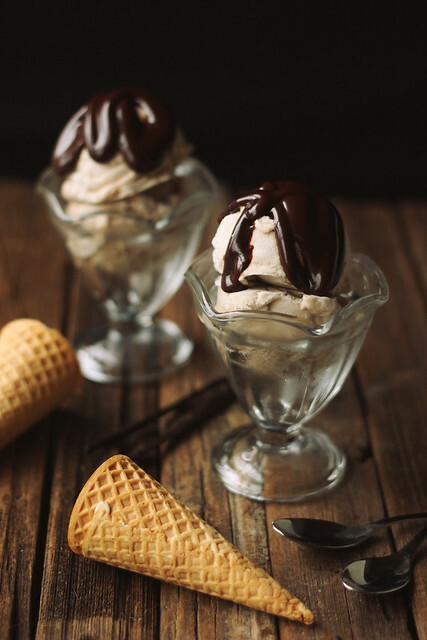 I am keeping this tutorial super simple and to the point, but, for more in depth information about the various ingredients, notes and tips on freezing, storing, tools and lots more – check out Dairy-Free Ice Cream. Full fat coconut milk makes for a rich creamy ice cream. Avoid coconut milk (aka beverages) from cartons, they are too watery and won’t provide that same creaminess. 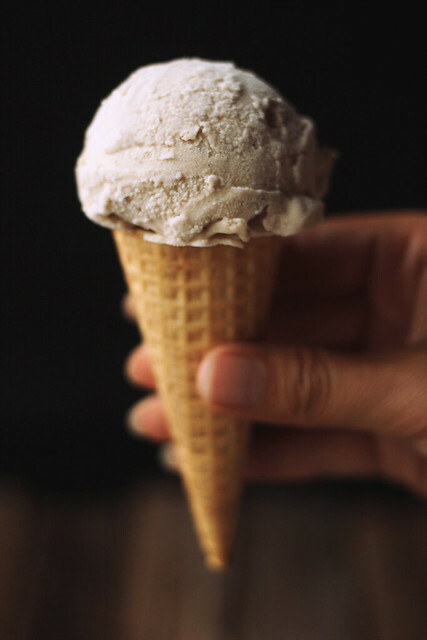 Non-dairy milks such as almond cashew or hemp have pretty neutral flavors and makes it so the coconut flavor doesn’t over power the ice cream. I prefer homemade almond milk. Dates are both Kelly and my preferred sweetener for homemade dairy-free ice cream, as they are naturally sweet and also help thicken the ice cream quite nicely. 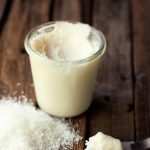 Coconut sugar is great for a caramel-like flavor and stevia is a great option for those looking for a sweetener that doesn’t affect blood sugar levels as it’s zero on the glycemic index. Just remember, the less sugar the ice cream has, the icier it will be. The freezer can create ice crystals and can make for an icy ice cream , these prevent that from happening. I was surprised at how incredible the results were when I used the unflavored gelatin. The bonus is, gelatin has great gut-healing properties, too. FYI gelatin is not vegan! 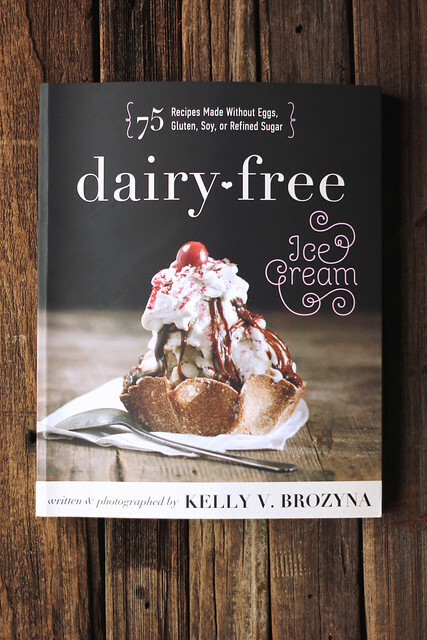 Grab a copy of Dairy-Free Ice Cream by Kelly Brozyna for tons of great flavor options and amazing recipes! 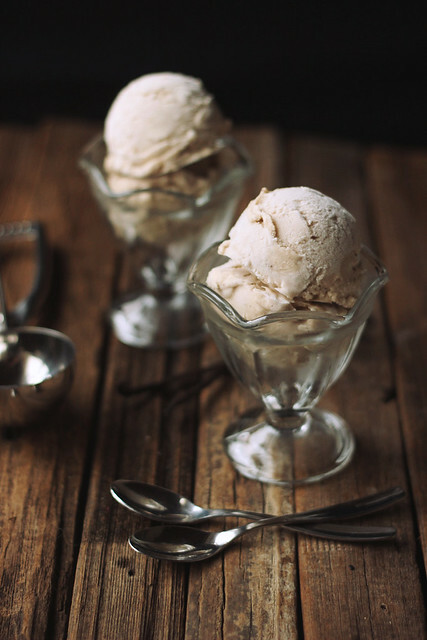 for Amazing Creamy Dairy-free Ice Cream. 1. Put the coconut milk, dates and soaked vanilla bean in a blender and puree until smooth. 2. Add the almond milk (or other non-dairy milk) vanilla extract and thickener (if using). Puree until smooth. 3. Refrigerate for about an hour or so, until cold. 4. Pour into your ice cream machine and churn per the manufacturer’s instructions. * this was my addition to Kelly’s standard vanilla ice cream. 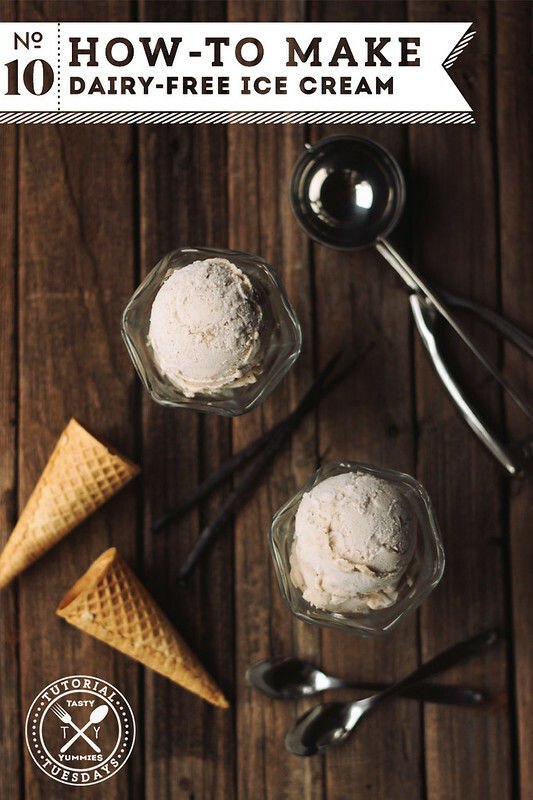 I find a whole vanilla bean to take the flavor of vanilla ice cream to a whole another level, feel free to leave out and opt for just the extract. It isn’t necessary to the recipe, I just love me some vanilla bean. Disclosure: This post contains affiliate links. If you make a purchase using these links – your cost remains the same, but I earn a small percentage to help support this blog. Thank you, your support is so appreciated. I’ve been seeing pictures of recipes from this book all over the place and it had me seriously craving ice cream so I made some dairy free ice cream over the weekend. I used egg yolks in mine like more traditional ice cream but I will definitely be trying the gelatin thing! I used honey as a sweetener which obviously imparted a honey flavor to my vanilla ice cream which I enjoy but do the dates impart more of a sweet taste without any specific flavor? 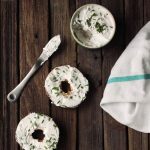 Your food photography is absolutely amazing!!! That’s probably one of the coolest cookbooks I’ve ever heard of! My hat’s off to Kelly. I love making ice cream with coconut milk, but haven’t made very many exciting recipes. I’ll have to take a peek at her book! Instead of gelatin, what about chia gel or agar? Beth, I don’t have an ice cream maker (to be honest, I’ve had a few in the past and ended up tossing them out because they really barely worked)… could I churn this in the blender at a lower speed, for example? Or even in the food processor? Hi there! I’ve been trying a few recipes and each time they end up unscoopable icy blocks. I’m following the directions to the letter (dates, gelatin) but I’m not getting that creamy consistency. Any advice? Thanks! This sounds delicious, perfect summer treat!! The photos are beautiful!!! This looks really nice. I am going to try this out very soon. Btw, the pictures you posted are really awesome. Thanks so much Aly. I hope you enjoy this if you try it! Dumb question. 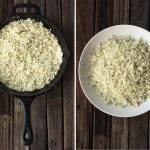 How do you soak the vanilla bean? Like what do you soak it in? 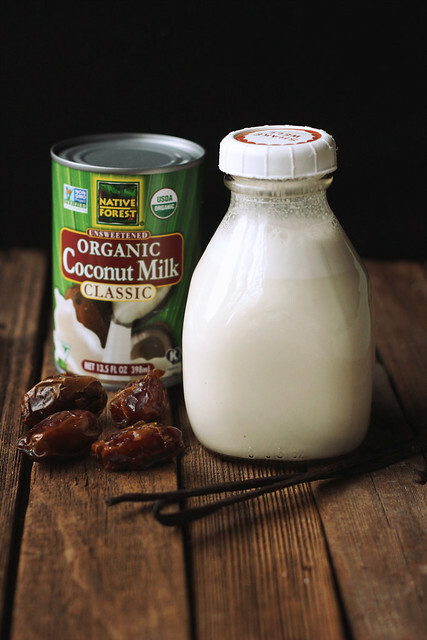 Do you have a substitute for the coconut milk.? You could try any non-dairy milk, however it is the fat in the coconut milk that makes this creamy, rich and less icy. A regular nut milk would provide much frostier results. This was the best DF vanilla Icecream I have ever made. I find using all coconut milk gives an overwhelming flavor which I don’t care for. I used Almond milk as suggested with 1 can coconut. Also used medjool dates for the sweetener and gelatin for the thickener which also seems to keep it from getting rock hard in the freezer. Vanilla bean Yes!! Thanks for the great recipe. My kids and I finally got around to making this ice cream today. It is delicious! We all loved it! I rarely eat dairy anymore, but this is honestly better than any homemade dairy ice cream I’ve ever had or made myself. Thank you to you and Kelly. We’re going to go out and purchase her book this week!